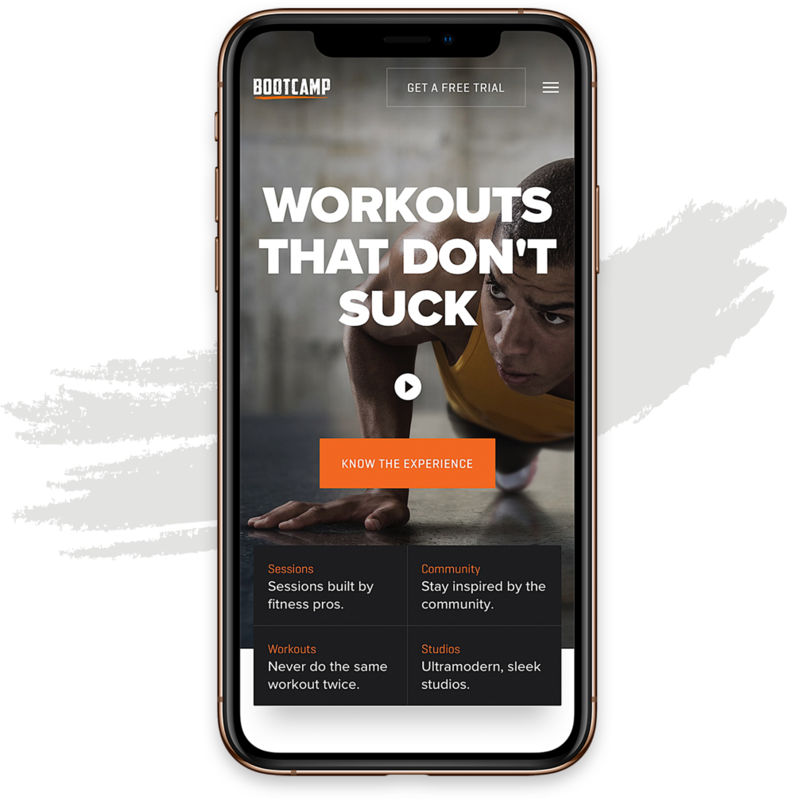 Staying true to the Tough Mudder value of teamwork, we co-created a web application for their franchise of boot camp gyms. 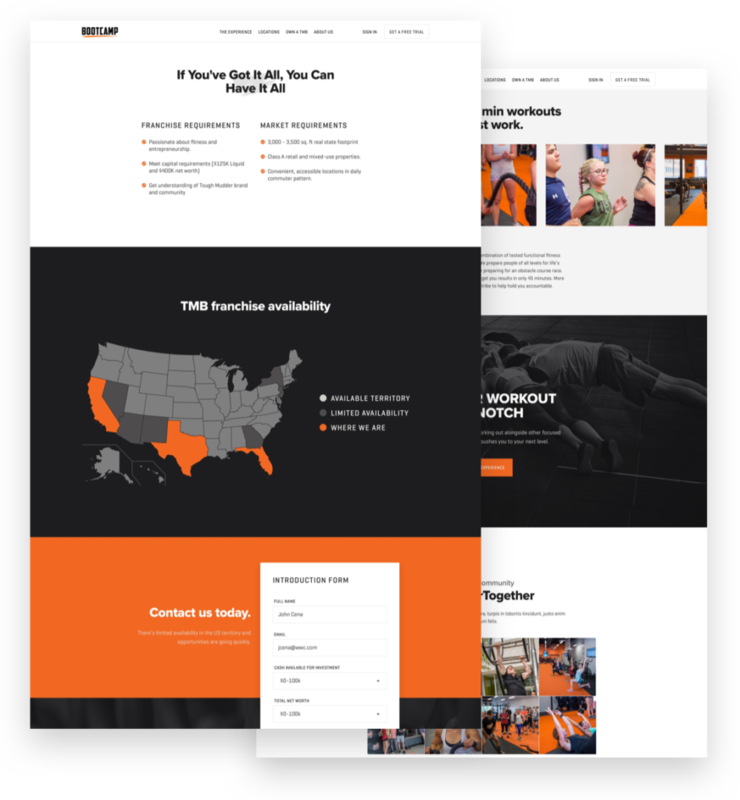 Nolte partnered with Tough Mudder to redesign the Tough Mudder Bootcamp website from the ground up. The goal? To give Mudders, franchisees, and administrative staff an enjoyable, frictionless experience. Tough Mudder Bootcamp (TMB) builds community by bringing outdoor sports and obstacle course fanatics together at their gyms and by hosting challenges throughout the year. Those communities have responded with gusto! As a result, TMB has expanded operations, increased membership, and opened a new studio. This growth made the TM team realize that they needed to support their business with a better online presence and customer experience. CX had too much friction. The many visual elements on the website were overwhelming, and registration confused people and forced them through too many steps. For staff members and franchisees, uploading and maintaining content was tedious. They needed to optimize various manual administrative tasks and spend less time manipulating spreadsheets. 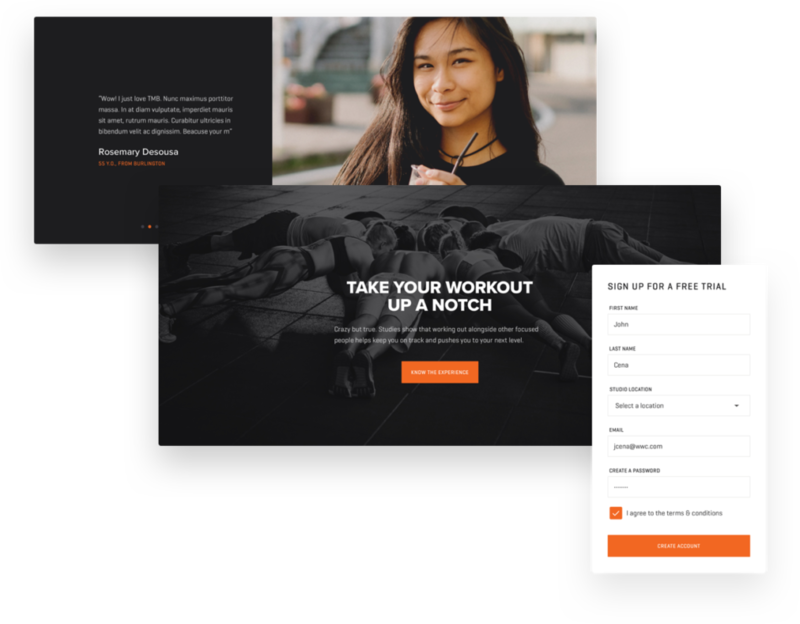 TMB also wanted Nolteños to help them select a powerful CMS platform that offered a seamless API integration with Mariana Tek’s boutique fitness management software. We could not, however, simply jump ship on the old CMS. Tons of valuable legacy content needed to make the transition to the new platform. Nolteños and the TMB team tag-teamed product strategy, user experience mapping, TMB’s style guide, content guidelines, and wireframes. Agile methodology provided the guardrails, and Cathrin Bowtell at Tough Mudder provided business context and served as the Product Owner as we progressed through three two-week sprints and develop the product end to end. Over that two-month period, the joint team met twice a week to stay aligned and ensure that development was meeting the stakeholders’ expectations. Nolte used better UX and visual design to improve the overall online experience for three key stakeholders: Mudders, franchisees, and TMB administrative staff. We developed a high-performing WordPress website with an intuitive backend management structure and robust content management that meets the needs of both B2B and B2C customers. 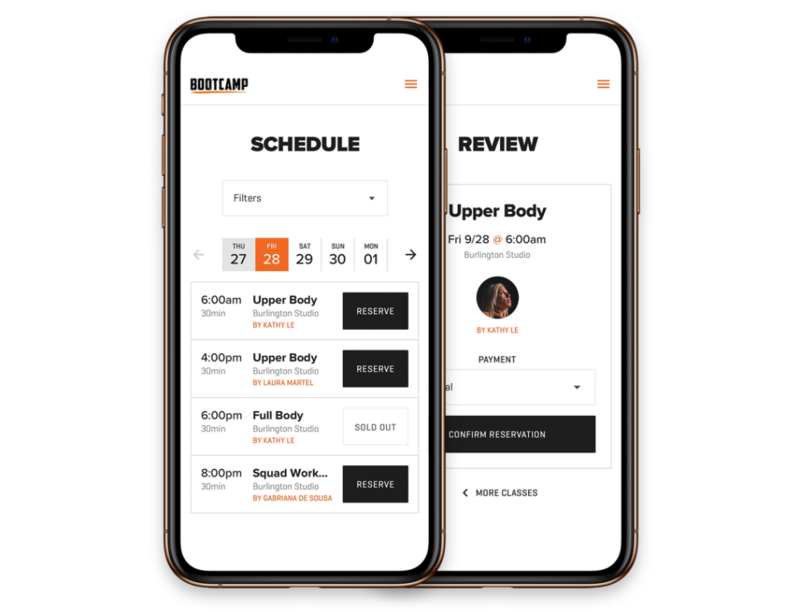 The new website features an improved booking and ticketing experience through the API integration with Mariana Tek and easy administrative access for all franchisee gyms. We also successfully migrated all of Tough Mudder’s legacy content. 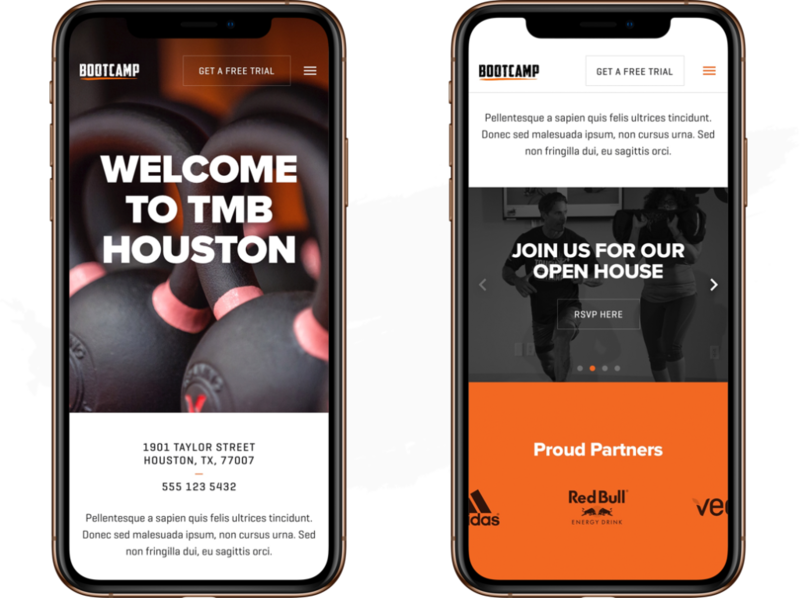 The launch of TMB’s new website accomplished exactly what the leaders had hoped: a drastically improved Tough Mudder experience. TMB wanted their new platform to be easy to use, and it is. They can now update or change image and video content as often as they like. Mudders now have access to a membership portal where have full control over their experience. They can book and purchase tickets quickly and easily. Franchisees can now access the portal with their unique credentials and manage administrative activities and personalize their pages to better serve their members. The entire Nolte team has been amazing and are important partners to me and the TMB team.